Multi-sensorial installation and performance explores physical fitness as a form of contemporary ritual and as a means of personal and collective transformation. Through engaging the body and the breath, the movements create a transcendent flow between the physical and the non-physical, acknowledging the body as a site for affective, sensorial, intellectual and the spiritual. 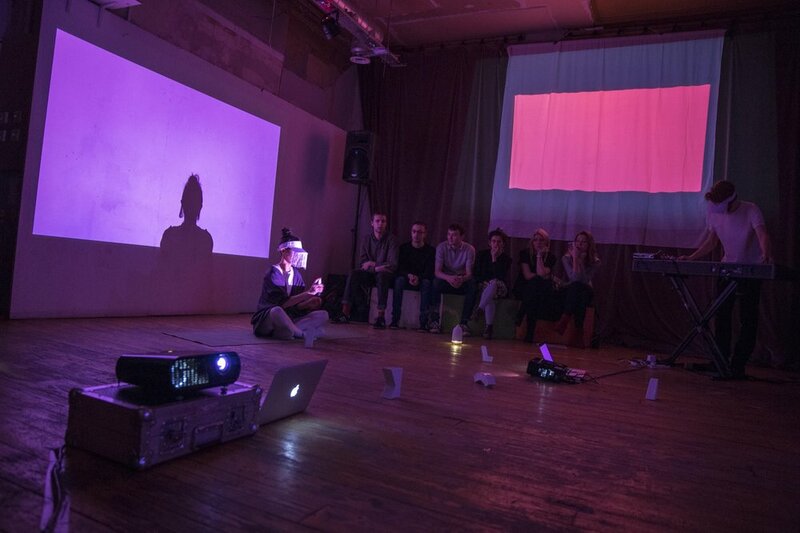 Working in collaboration with Glasgow-based ambient and classical composer Blair Coron, the energetic elements of scent, coloured light, movement and vocals come together with improvised sound to create an environment for embodied experience. Materials: porcelain etheric renewal rattles, pollster, cotton, lycra, yoga mats, aroma diffuser, organic essential oils, (cardamom, frankincense, palmarosa, clary sage, vetiver, bergamot), atomisers, projectors, spectral healing wheel digital video (8:44).